Today my first baby turns 17! Hard to believe this 6'2" boy on the verge of being a man once lived inside me, that there was a time when Mom was the only girl in his life and all it took to bring a look of sheer joy to his face was to tell him Daddy was home. This photo is from his birthday last year, with Fr. Gordon, with whom he shared both a middle name and birthday. 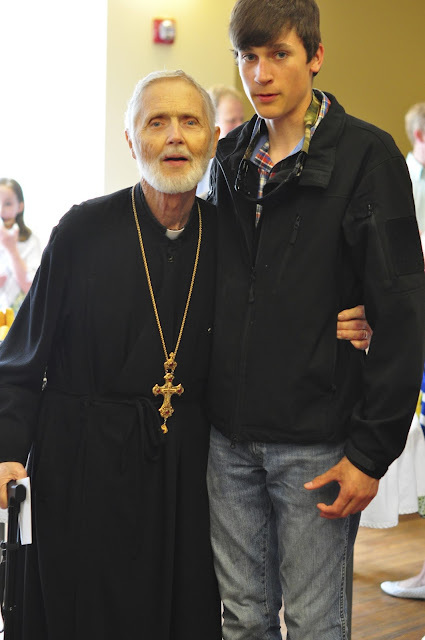 It is the last photo I have of them together, and Fr. Gordon's last birthday on this side of eternity. Memory eternal, and many years to my not so little boy! lovely picture. HUGS. It can be hard to see them grow up! so fast! all so quickly.... may God have mercy! Thanks for posting this great photo and sharing this special occasion!!! Happy Birthday to my son's dearest friend and God grant many years of health and joy to all!! !